As you are well aware, I'm constantly on the prowl for new beauty tips and interesting brands. I've stumbled on so many gems thanks to the generous women who photograph & share their holy grail products. Yesterday I was scrolling, per usual, when I stumbled upon a reveal of a brand I'd never heard of. I quickly took a screenshot then moved on. Hours later, another product from the same company showed up on my feed. Could this be a mere coincidence? Or was the universe trying to get my attention? Brittany Hampton's caption was enough to peak my interest. 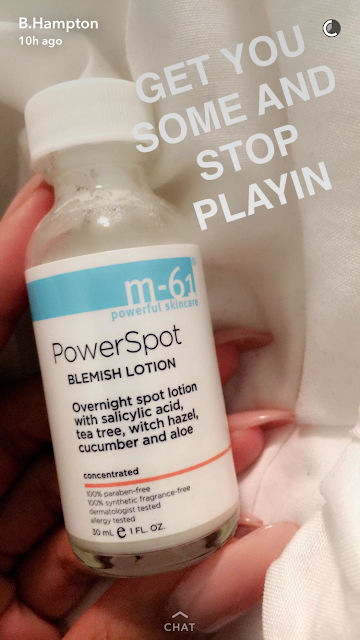 She strongly urges us to get some [of the PowerSpot blemish lotion] and "stop playing." According to the label, this appears to be an overnight acne treatment infused with awesome botanicals such as tea tree oil, witch hazel, cucumber and aloe. Keep in mind that Brittany has what I consider to be "perfectly flawless skin." It practically radiates an amazing glow even when she's sporting a bare face. I've never seen her with a pimple.....ever! Why would she even need a blemish control product? 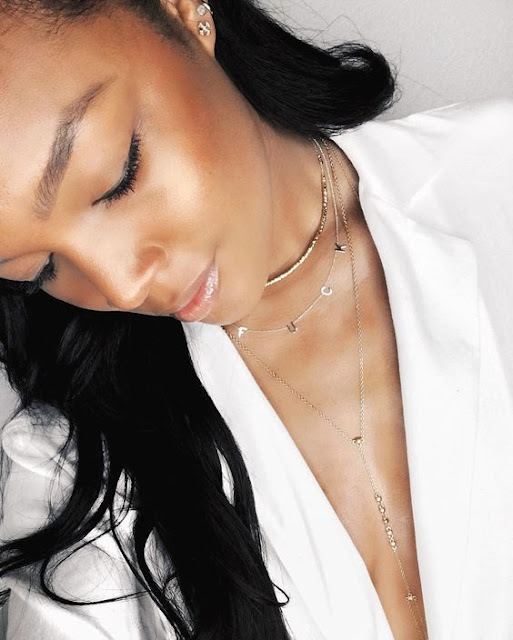 This overnight acne lotion may be a contributor to her perfect skin. If M-61 blemish lotion really works, then she might be preventing acne breakouts before they become a problem which means Brittany is also avoiding having to deal with stubborn acne scars. Years ago, I broke out all the time. After a long, hard-fought battle, I finally got my acne somewhat under control. I still get a pimple here and there but it's nothing like the breakouts I suffered before. I've taken a passive approach to dealing with acne and, as a result, I'm having to deal with scarring. 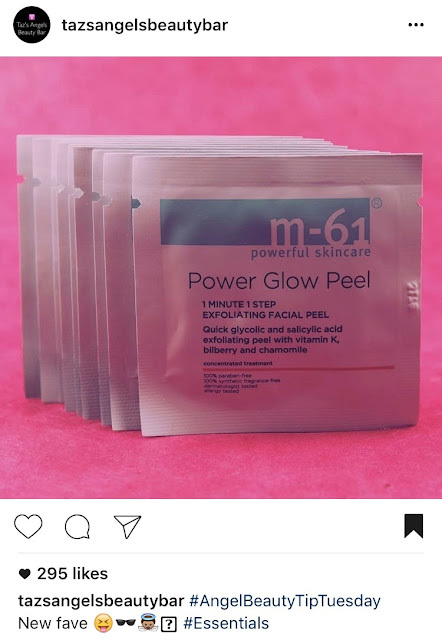 Speaking of acne scars, it appears that the good people at M-61 have just the thing that may help with that. 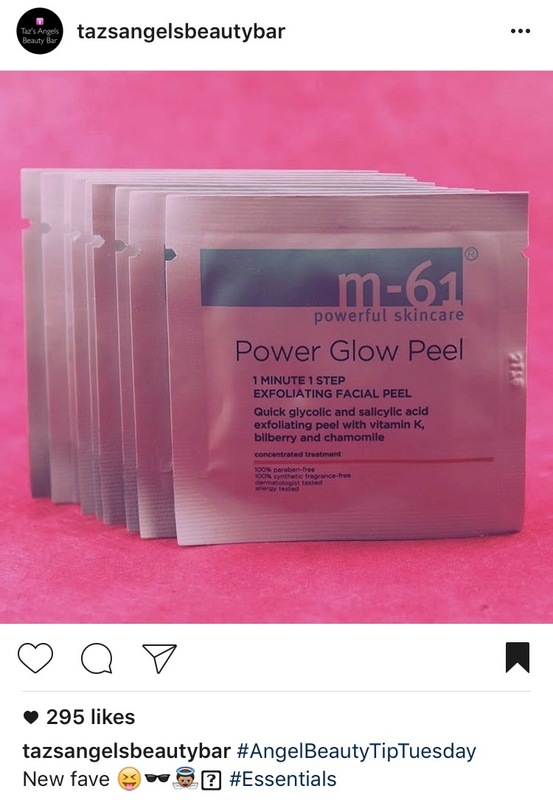 As I mentioned early, on the exact same day that I was introduced to the brand, this image came across my timeline with the simple caption: "New Fave"
Pictured were M-61's PowerGlow peel pads which, like their lotion, seems to be a blend of exfoliating acids (glycolic/salicylic), nutrients like vitamin K to help reduce discoloration plus ingredients with anti-inflammatory properties. This brand has really peaked my interest....these two products in particular. In my current skincare routine, I have nothing deal with unsuspecting breakouts. That needs to change. An overnight acne treatment sounds like a dream come true right about now. while the ingredients look good, with the amount they are charging "the ordinary" skincare brand is still the way to go.